Michele Hernandez's book is accessible and useful. I have to be honest and say I was prepared to have some problems with Michele Hernandez’s book, Acing the College Application. After all, this was the same woman whose previous book Jay Mathews excerpted with a snarky, snooty quote about how applicants to selective schools should act when they are confronted with an interviewer who is less than intelligent than the student (The answer was not to worry because that person probably didn’t attend a selective institution anyway!). But I will say that I found the book engaging, practical and remarkably free of those types of statements. In straightforward prose, Hernandez marches incoming seniors through each step of the application process. 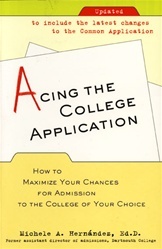 Drawing on her four years at Dartmouth, Hernandez talks about, among other topics, the relative importance of academics and extracurricular activities, how to develop and share an activities list that will showcase the student’s talents, interview myths, ingredients and examples of effective essays, and how to handle the Common Application. I will be interested to read what others have to say, and, so far, this has seemed to me to be the most helpful book I have yet read. I’ve got a few left, though, and will keep you posted. What books, articles, videos or other resources have you found helpful in the application process?